The building of Howard College at the University of KwaZulu-Natal was donated by Durban businessman T.B. Davis in remembrance of his son Howard who was killed in the long and brutal world war one Battle of the Somme in northern France in 1915. The Natal University College, which was started in Pietermaritzburg in 1906, extended tuition to Durban in 1923, using the premises of the Natal Technical College. By the mid 1920s, the university was looking to establish its own campus and Davis donated one hundred and thirty thousand pounds towards the construction of a building. The college building was constructed on fifty acres of land in the Stella bush. Howard College was opened in 1931 by the Governor General of South Africa, the Earl of Clarendon. The Memorial Tower Building at Howard College was built to commemorate students who had died in WWII. Construction of the building, which cost two hundred and thirty five thousand pounds to complete, was undertaken in 1948 and completed in 1972. 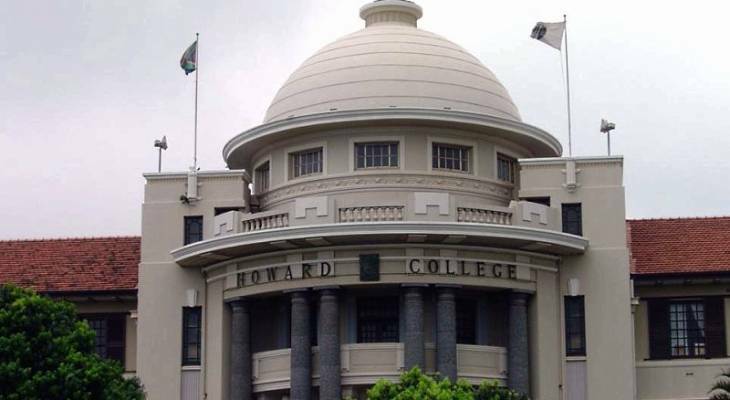 The exterior of the Howard College building has been designed in the Union style, and has little Deco reference, however, inside is a treasure trove of Art Deco. Sculptural elements above the doors in the entrance foyer, the stairs and the decoration of King George V's picture all indicate a strong Art Deco influence. Howard College, UKZN Information and Nearby Accommodation.